Using VWO, you can target specific visitor groups through a variation in your test. Targeting a visitor segment through variations helps you customize the content offers to a specific group of your website visitors. Use this feature to ensure that only those visitors who qualify as per the segment conditions will be able to access a specific variation. For example, you can create a variation with custom promotional offers for the visitors accessing your website from one specific location, or certain hour of the day, and so on. If you have migrated to the Bayesian Statistical model, you can set up variation targeting only for ‘Personalization’. The targeting option is not available for A/B tests. PRO-TIP If you have set variation-level targeting, the traffic percentage you specify will only apply after the segmentation rules. For example, if you have targeted Control for desktop visitors and Variation for mobile users, your website visitors will access the respective version based on the segmentation rules applied and not based on the traffic percentage set for each variation. On the test details page, click Settings. From the options under Settings, select Others. For personalization, select Targets under Settings. From the options available, select Customize traffic allocation for each variation. From the names of all the variations that appear, click All against the variation you want to target. This section contains default VWO segments that you can use for your variations. You can select a default segment to target visitors through a variation, if required. Click here to know more about default visitor segments in VWO. This section allows you to define a custom visitor segment to target through a variation. To define a custom segment, you must set conditions that determine whether a user qualifies to be shown the variation. 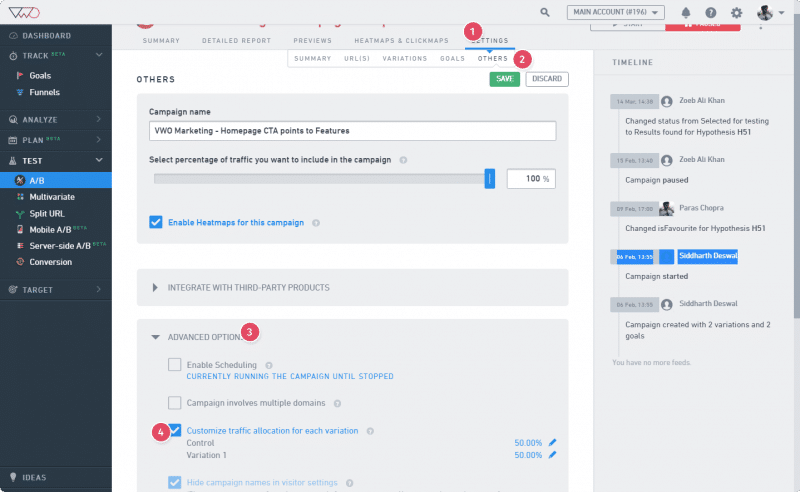 Click here to know more about how to define custom segments for targeting.